Guarantee Communication and Support for Living At All Times and In All Situations! 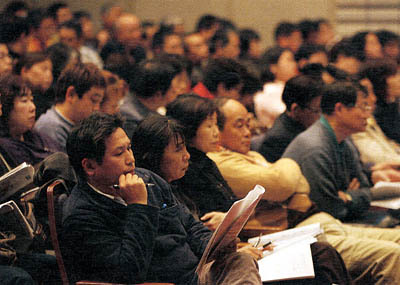 Participants listen attentively to discussions on the new law. A total of 436 participants from all 47 prefectures in Japan attended the rally. The venue was practically packed and heated up by the energy of the participants. Committee members of the Central Headquarters presented their ideas on “How to ensure the budget for 2006-2007”, “How to deal with consultation support program”, “Identifying important issues and actions to solve them”. The discussions were open to participants by accepting questions from the floor. As a result of the discussions, participants reaffirmed the importance of information exchange among Local Divisions on concrete initiatives which are being taken, and agreed on the following as being the key issues for the future: (1) how to conduct needs assessment at local government level, (2) how to realize as soon as possible, the participation of people with disabilities in disability-related planning, (3) how to develop expertise and broad networking, including prefectural-level projects with information centers for the Deaf at the core, as well as national-level networking projects. According to the new law, which aims to provide support services to people with disabilities, local administrations must draw up a disability welfare plan. 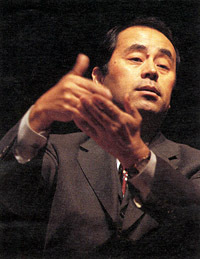 Each prefectural administration will set the target for the number of sign language interpreters that must be trained to accommodate all sign language interpreting needs and the government will assess the budget for the project. In the new law, there are two articles related to communication support. Article 2 Provision 3 says “Local authorities should guarantee information for disability welfare services” and Article 77 declares “Local authorities are responsible for conducting sign language interpreting activities as part of daily life support activities”. The government is expected to distribute a draft guideline to local authorities in March after consultation with related organizations. It is important to pay close attention to the contents of this guideline to check if it sufficiently covers the requirements to guarantee communication. The National Liaison Council of institutions for multiply handicapped deaf people pointed out that almost all of the 106 items in pilot projects related with disability-assessment are adopted from assessment items for nursing-care insurance which puts multiply handicapped deaf people into milder categories than their actual disabilities. Seventy percent of currents users of 7 institutions in Japan are categorized into group A (severe). However, under the categorization of the new law, more than eighty percent of users will be categorized into group 1(mild). Moreover, additional support systems for persons with severe multiple disabilities under the current support system will be abolished, which will result in a reduction of 20 million yen from the annual budget for each institution. This would lead to concerns about a reduction in the number staff members at institutions. 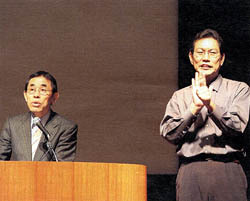 This entry was posted in Japanese Deaf News. Bookmark the permalink.